We must hear from everyone, he wrote, every person who has ever taken action with the Dandelion Insurrection. The Man From the North called forward the voices of the Dandelion Insurrection, lifting the conversation on tactics out of the bullhorns of the few and into the hearts of the many. For too long, the loudest voices had dominated the discussions on tactics. Many people had been shoved into silence; now was the time to speak out. He stepped down off his platform, quieted the roar in his throat, and beckoned to the timid, the shy, the tired, the weak. The choice was not a decision for one voice alone. In a leaderful movement, everyone had to step forward, each person had to choose to embody the world they longed to create. From all directions and corners of the country, they came. The Man From the North was joined by the Woman in the Southwest, the Kid on the Coast, the Guy in the Bible Belt, the Schoolteacher by the Lake. The answer to Charlie’s passionate cry flew across the landscape of controversy with a golden clarity of heart. 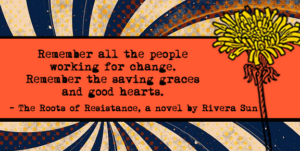 From the Mechanic in the Rust Belt, the Pastor Up Country, the Emancipator Down South, the Free Ranger in Texas, the Fisherman in Maine, letters and essays flooded the Alternet. These were the voices silenced by the smash of windows and the vitriol of hate. These were the people who couldn’t – wouldn’t – throw bricks. These were the mothers and fathers who could not bring their children into a street fight. These were the original dandelions that had chosen nonviolence in dangerous times. We are the true roots of resistance, they declared, and the scraggly leaves, golden flowers, and windborne seeds. They remembered the days when reading an essay was treason. They remembered the courage it took to speak truth out loud at the dinner table. They remembered the times when to be kind, be connected, and be unafraid was dangerous and revolutionary act. They remembered how the Dandelion Insurrection emerged from the smallest stories of resistance: mothers who told the truth; children who shared their lunches; men who stood together in times of distress; people who turned back the tide of fear in their hearts; communities who burst forth with love. We are the Dandelions, the insurrection against hate, the flowers bursting through concrete and the grip of control. We stand enduring, indomitable, and eternal. We are the body of the people, immortal. We’ll out last the dangers. We’ll rise to the challenges. We’ll live to see the dawn of our changes arrive with the sun.